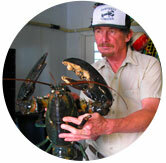 James Mataronas III started Sakonnet Lobster in 1971. He then built his 40′ lobster boat “Sunny Jim” (named after his grandfather James “Sunny Jim” Mataronas) in 1972 inside the Sakonnet Lobster building. Jim, his wife Margaret and their children run the company personally-catching the freshest, liveliest-local caught lobsters around. Fresh ocean sea-water is pumped directly from beautiful Sakonnet Harbor underneath the road to our tanks to our modest retail store.